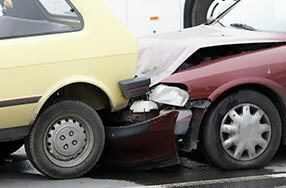 Rear-end collisions are probably the most common type of car crash that we see. Depending on the circumstances, rear-end crashes may cause catastrophic injuries or even death. However, crashes can result in injuries even when they appear to involve only minor impact. Common injuries include neck and back injuries, closed head injuries, and trauma to any part of the body thrown into hard surfaces within the vehicle (e.g. a knee may be injured by hitting the steering wheel column). Rear-end crashes frequently happen in stop and go traffic, which is all too common in the greater Seattle area. Often times, the rear (striking) vehicle will push the forward vehicle into other cars ahead. Under such circumstances, occupants of the struck vehicle will experience two impacts: first from behind, and second as they are pushed into the forward vehicle. People in any of the vehicles involved may suffer injuries, and may be entitled to compensation. Sometimes, the vehicles involved will appear to sustain only minor damage, even from significant impacts. This may be because the car’s bumper absorbed much of the force, as it is designed to do. Frequently, insurance companies will estimate the cost of repairs without checking for any damage underneath the bumper. It is often important to remove the bumper in order to determine the full extent of the damage, which insurance companies do not usually do. This practice harms claimants in multiple ways: First, this may result in inadequate repairs to your vehicle. The repairs may look fine on the outside, but the integrity of your bumper may be compromised. Second, insurance companies regularly argue that minimal damage to the vehicles means that the occupants of those vehicles must not have been injured. By turning a blind eye to certain aspects of the vehicle damage, the insurance company sets itself up to later dispute whether the crash caused your injuries. For this reason, we generally recommend that you have your vehicle repaired by a body shop that you trust, and not a shop selected by the insurance company. Under Washington law, the insurance company may not insist on any particular shop. As noted above, damage to the vehicles is not reflective of whether the people inside the vehicles were injured in a rear-end crash. Particularly with newer vehicles, cars are designed to withstand crashes to some degree, but our bodies are not. Sometimes people will walk away without a scratch from crashes totaling their vehicle, and sometimes people will suffer life altering injuries in crashes that caused only minor vehicle damage. At Kraft Davies, PLLC, we listen closely to our clients to understand exactly how they have been hurt, and how those injuries have impacted their lives. No two clients are the same, and a claim cannot be fairly evaluated without taking the time to fully understand an individual’s unique circumstances. We have found that the best way to get insurance companies to pay fair value on claims is by showing the human impact of the crash on our clients. For more information please see our related pages on What To Do If You Are Injured In a Car Crash, Your Rights After Being Injured In a Car Crash, Motor Vehicle Injuries, and Fatal Car and Truck Accidents.